You will find here summaries of our latest news. For further reading and more news, click on the associated links and follow us on your favorite social network. If you are a member of the press, please visit our dedicated Press Release section. Don't miss our latest news ! Follow us on your favorite social network ! We’re happy to announce a new release! Following the introduction of floating windows in the last release, we added a new “Secondary Viewport” which provides a second, independent view of your document to save unnecessary navigation while you work. It has all the common navigation and drawing capabilities of the main view to give you as much freedom as possible and create your own workflow. 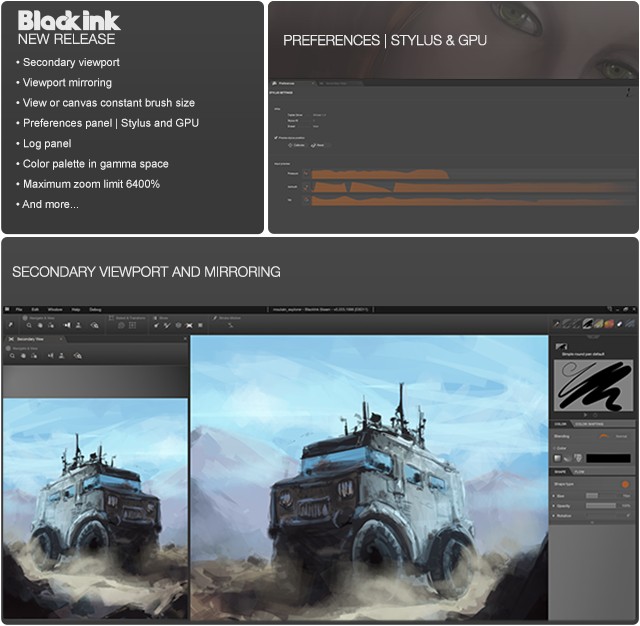 We also added a log window to follow what’s happening inside Black Ink and a Preferences window. This first batch of options in the preferences will help you set-up and troubleshoot your tablet as well as adjust GPU options. On the drawing side, you can now choose whether or not to have a constant screen brush size and flip your canvas horizontally or vertically with corresponding shortcuts. Very useful for sketches! For more details about these features and the bug fixes for this version, you will find the complete release notes here. About future updates, we are still working on our fill tools which are shaping up to be a very interesting and complementary addition to Black Ink’s features. As always thank you for your support and see you again soon for more news!